This morning we left our hotel in Koriyama and caught a train west to the town of Aizu-Wakamatsu, which is a castle town in western Fukushima known for its samurai tradition and sake breweries. 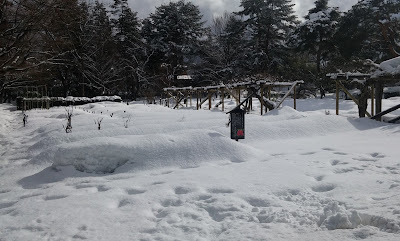 The name is the result of many mergers, though for brevity I'm going to refer to the town as Aizu, which is the name of the western area of Fukushima prefecture. We had a bit of a late start this morning and by the time we'd checked out of our hotel, left our luggage somewhere and made our way to the station it was around 09:30. 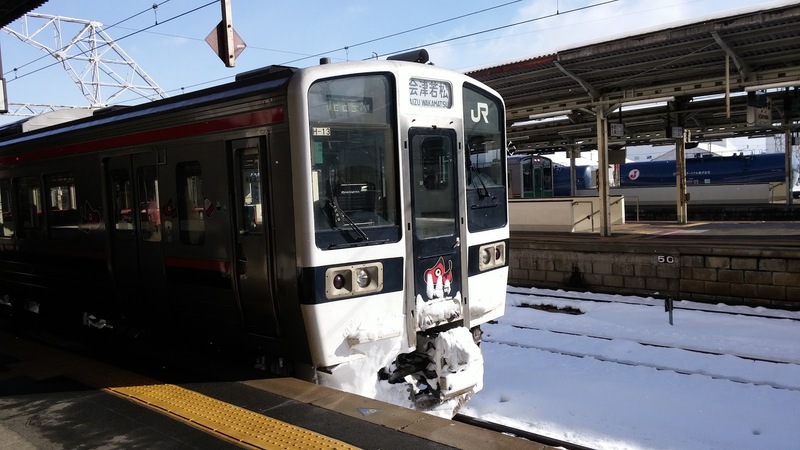 There's about a train an hour between Koriyama and Aizu and it takes around 70 minutes to make the journey at a cost of around 1100 yen. We had the Japan Rail pass , so it cost us nothing to get the next train at 09:40 which got us in just before 11am. 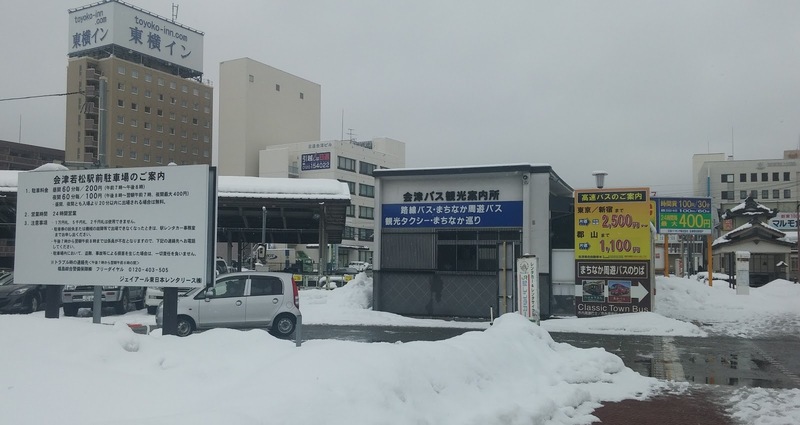 Unfortunately most of the cities sights are not located close by to the main Aizu-Wakamatsu station, however there is a tourist oriented service called the Aizu Loop bus that circles past the main attractions. A single ride is 210 yen, but we paid 500 yen for a day pass as we thought we'd probably catch it more than twice. There are quite a number of attractions to visit in the city, more than we had time for actually, so we prioritised. Skipping the samurai residence was easy as we'd seen similar exhibits previously and were not especially interested. 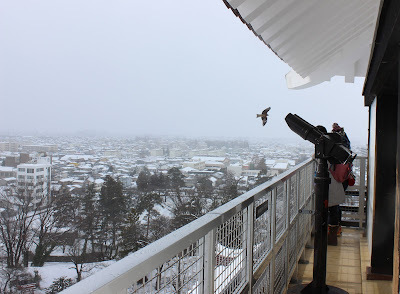 We also passed on the Fukushima Museum as well as Iimoriyama which is a nice historical mountain area which we figured would be too difficult to navigate in the snow. This meant that our first stop on the loop bus, travelling clockwise, was the Oyaku-en Garden. This garden is a pretty landscaped garden with a pond that cost us 320 yen to visit and we had a nice stroll around. Oyaku means medicine and the name comes from the fact that the garden was used to cultivate plants that were thought to have medicinal properties. These plants are still grown today, though we couldn't see much of that area due to a thick layer of snow. The pond in middle was only partially frozen and looked relatively scenic surrounded by snow covered trees and traditional buildings. However I'd recommend visiting in a warmer season if you have the choice. After our brief visit we made our way back to the bus stop and rode the loop bus a little further to the Tsuruga Castle park. Tsuruga Castle was first built in 1384 and went through many different regime changes until it was destroyed in 1868 during a rebellion against the Meiji Government, before being subsequently rebuilt in the 1960's. 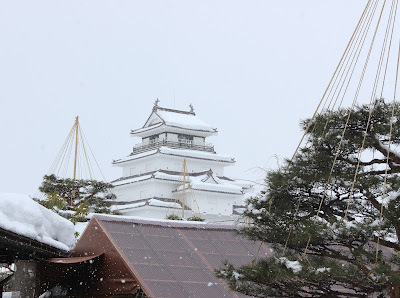 The Tsuruga Castle Park surrounds the castle and we had a good view of the castle exterior on our way to the Rinkaku Teahouse which is also inside the grounds. After having a look at the gardens (200 yen), we stopped in at the tea-house itself to have a rest and enjoy some macha tea with a traditional Japanese snack. Next we continued on to Tsuruga Castle and spent some time viewing the various exhibits inside, enjoying the view out over the town from the top and checking out the souvenir store. Once we were done with the castle it was time to head to what was probably our main reason for coming to Aizu: Sake! Sake (pronounced 'Sa' 'ke'; i.e. it does not rhyme with rake or blake) is known as nihonshu in Japan and is a type of rice wine made by fermenting rice that has been polished to remove the bran. It's drunk chilled, at room temperature or heated and Kate and I both really enjoy it. 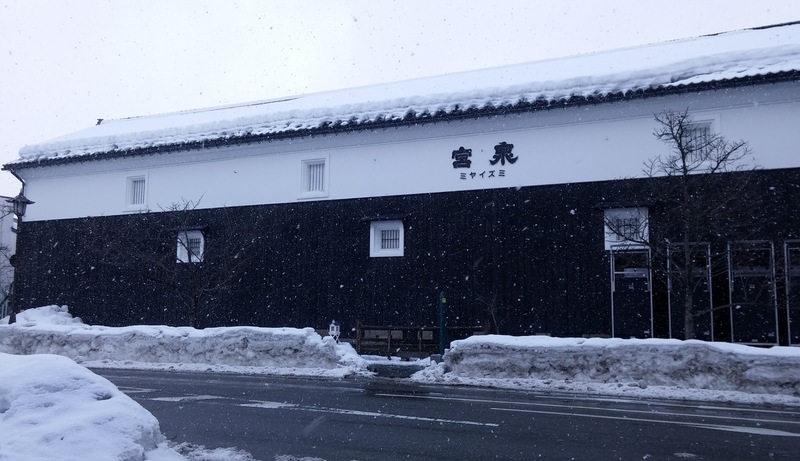 Aizu has long been a traditional producer of Sake as the area has all the ingredients required to produce high quality sake: rice, large amounts of pure water and cold weather. 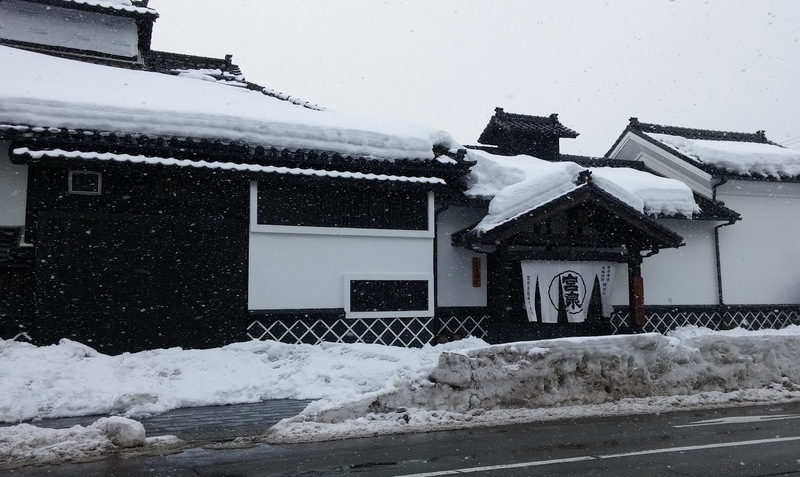 The main ingredients in sake production are water and rice and the quality of these ingredients affects the final product while cool temperatures help with the brewing process, especially before modern refrigeration. 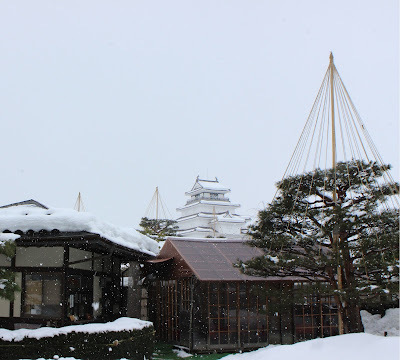 The first sake brewery we visited was the Aizu Sake Museum which is located only a short walk from the castle park. Miyaizumi, a local sake producer, converted one of their old breweries into this museum and its possible to take a tour for 300 yen to see how sake is made. After finding the building we went into the gift shop and registered for the next tour which was due to depart in a few minutes. As we were from a non-Japanese speaking country someone from the nearby tourist office across the road was called over to translate the main tour (there were about 12 Japanese people and us on the tour). I spoke to him a little bit in Japanese which seemed to convince him that my Japanese was better than his English and that I should translate for Kate. I did my best but struggled with a lot of the sake/brewery jargon. Thankfully he did rephrase a lot of what was said by the main tour guide which helped- so we both did our best. I actually learnt a lot of things here such as the fact that despite being called rice wine, the process of making sake is actually much closer to beer as the starches are brewed to convert them into sugars which are then turned into ethanol. However, unlike beer this process is completed in a single simultaneous step instead of two discrete steps. We also learnt about the various different types of sake and how the extent of rice polishing affects the quality, with higher amounts of polishing resulting in a higher quality brew. While on the tour we got to see them washing the rice and such out in the main brewery area, which was very interesting. Once we'd finished our tour we even had the opportunity to sample a few different varieties, including Amazake which is a sweet low-alcoholic drink also made from fermented rice. After sampling we bought a few small bottles of our favourite varieties. We'd have bought larger bottles but unfortunately, sake, like wine, doesn't keep for very long after opening and it's also a bit harder to finish of a whole bottle due the higher alcohol content (18-20% compared to wine at 9-15%). Another downside is that sake, unopened, doesn't improve with age like wine does but instead deteriorates quite rapidly. In fact in most cases you shouldn't store even unopened sake for longer than about a year. It's actually a real shame as I believe this is one of the main reasons why sake is so expensive and hard to find in Australia. Anyway, after picking up our bottles we went back outside and continued on the loop bus to the Suihiro Brewery, another sake brewery. Suihiro is one of the largest and most famous sake producers in all of Japan and regularly wins both domestic and international awards. Along with many different types of sake, they also have products such as bath extract, sparkling sake and sake infused cake. 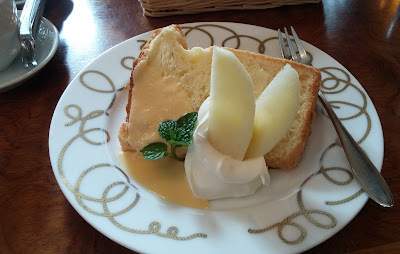 We hadn't really had much for lunch so far so we decided to try some of that sake infused cake at the attached cafe! After that we went on a tour of the brewery, which focussed on the history of the company and its people, though we also got to learn about the sake making process and then at the end we could try a variety of different bottles! Like at the previous place we purchased a small bottle of the flavour we liked best. Next we made our way back to the train station only to find that all the trains had been cancelled due to snow and high winds! We actually had to be in Sendai but it looked like we were going to be stuck in Aizu tonight instead. Luckily though the railroad isn't the only connection between Aizu and Koriyama and we learnt that we could actually catch the bus instead. A lot of other people also realised this and so we made sure to hurry over so we could get a seat. Good thing we did too as the bus we caught was absolutely packed. They even used the extra seats that dropped down into the isle to squeeze on as many people as possible. Unfortunately the snow caused chaos on the freeway which had sections closed resulting in a massive traffic jam. To make matters worse I had drank a decent amount of sake today, and let's just say that the lack of toilet facilities was not a wonderful thing. 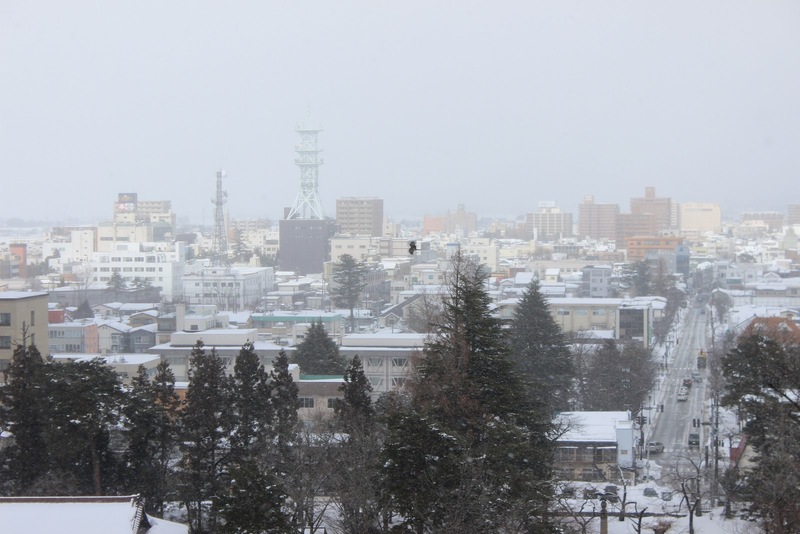 Eventually we somehow managed to make it to Koriyama where we collected our luggage and caught the next shinkansen to Sendai. Our hotel for the next two days will be the Daiwa Roynet Hotel located within walking distance of Sendai Sation. Tomorrow we're travelling to the nearby town of Ishinomaki to catch a boat to the famous cat island Tashirojima! I didnt know that sake was more like beer. Interesting story. Yes at least the production process perhaps. Otherwise it's probably closer to wine than beer (but quite unlike both).